Following his speech Dr. Nikolaos van Dam congratulates Dr. Bernard Bot and presents him the Linggadjati Award 2013. Mr. Adji Witjaksono, Chargé d’Affaires a.i. to the Embassy of Indonesia, receives the Linggadjati Award for Dr. Hassan Wirajuda, who had sent an Award acceptance video letter. About the comprehensive partnership, that finally was launched by President Susilo Bambang Yudhoyono and Prime Minister Mark Rutte during his official visit to Indonesia Dr. Wirajuda says: ‘As two resilient but dynamic economies, I believe the comprehensive partnership would make our two countries politically closer, economically beneficial, but most importantly, it fosters harmonious social relations among our peoples.’ And he concludes: ‘It is my hope that you will gain from my words, and from our example, a renewed sense of optimism, trust, and hope of a better future together. Although our cooperation has significantly improved over the years, we must also recognize the responsibilities that come with it. Building a bridge requires hard work, diligence and trust. It is a work in progress and at times the process will be challenging. With your support, I am sure we’ll be seeing a better relationship between our two countries and peoples.’ See under ‘events-speeches’ for the complete speech of Dr. Wirajuda. 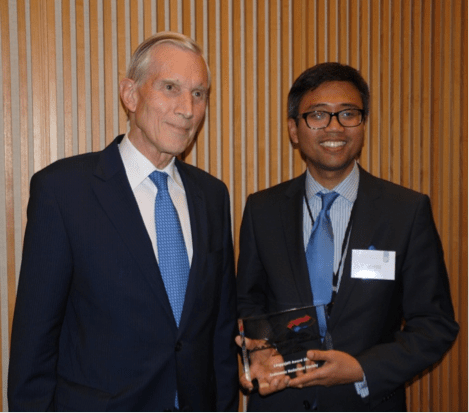 From the speech of Dr. Bernard Bot: ‘I am deeply touched by this award, and the more so since I receive it together with my former colleague and friend Hassan Wirajuda’. Dr. Bot also recalled how the name Linggadjati already circulated at his home when he was a young boy, since his farther was at that time also involved in the future of Netherlands-Indonesia relations. He still kept a picture of the Round Table Conference in the Ridderzaal in 1949 on his desk because his father was one of the participants in that historical conference. Bernard Bot furthermore underlined the importance of Linggajati since it was the first time the two parties negotiated on a foot of equality. Quoting from the book ‘Linggajati, Brug naar de Toekomst’, he said that ‘much bitterness could have been prevented if Linggajati had become the supporting beam for the new Netherlands-Indonesian construction.’ He concludes by saying: ‘Fortunately, ever since that momentous agreement, important steps have been set on the path towards ever closer relations. Many new supporting beams have been created in the meantime. It is up to us to create a long lasting construction between Netherlands and Indonesia.’ See under ‘events-speeches’ for the complete speech of Dr. Bot. From the speech by Mr. Witjaksono: Mr. Witjaksono conveyed the felicitations by Ambassador Retno Marsudi to the INS Board for the successful undertaking of this seminar as well as her warm congratulations to the recipients of the Linggajati Award 2013, Dr. Bot and Dr. Wirajuda. ‘Ambassador Marsudi expresses her deep regrets for being unable to come personally to this important gathering. Nevertheless, she extends her warm greetings to each and every one of you. Dr. Bernard Bot and Dr. Hassan Wirajuda have acted in a way we most admire. Both gentlemen, in their time, not only share a vision in the exercise of their profession but also a robust friendship,’ Mr. Witjaksono declares. ‘They have worked closely as Foreign Ministers from 2003 to 2007. Since the visit of Dr. Bernard Bot to Indonesia in August 2005, both Foreign Ministers propelled the relations between our two countries into a higher plane of cooperation. Thus, during the awarding of Bintang Mahaputra Utama – one of Indonesia’s highest decorative national honour, Dr. Hassan Wirajuda conveyed in his speech that what Dr. Bernard Bot did, has helped bring about the completion of a long healing process. As a result, both Indonesia and the Netherlands veterans honour each other by both joining the Independence Day ceremonies.’ He continues: ‘It is quite fitting for these great men to be awarded the Linggadjati Award for their actions speak for itself. The word ‘Linggadjati’ connotes different meaning for different people but in the end and in time, ‘Linggadjati’ itself has transformed its meaning equivalent to that of diplomacy and sustained peaceful solutions. That is why, the conferment of this year’s Linggadjati Award is somewhat special because the actions of these great men represent what the Linggadjati Agreement is all about – diplomacy and peaceful solutions are the best avenues in facing even the most difficult and greatest challenge.’ About the Comprehensive Partnership Agreement Mr. Witjaksono said: ‘This agreement is the basis for intensifying bilateral cooperation on a future oriented relationship on all fields: from political, economic, trade, judicial to the socio-cultural sphere. Through this, it sealed our relations by becoming true partners: by history and by destiny.’ Reflecting on the Dutch trade mission he believes this mission was beneficial for both Indonesia and the Netherlands. ‘On the one hand, it could be good for the Netherlands, its economy and its companies. On the other, it is also good for Indonesia as it provides solutions to the problems we face. I take for example the Garuda project, which was shown on the screen to protect Jakarta from land subsidence, and flood, to which a whole new city centre of Jakarta could emerge. Thus, as the old city of Jakarta (kota tua) was created by the Dutch, I can start imagining that the development of that the future new city could also have a Dutch contribution.’ Responding to the words spoken by Mr. Bernard Wientjes, he says: ‘While you are cognizant of being quiet late in approaching Indonesia, it seems there is the intention to catch up with other countries who have engaged us before you. The strong bond between our peoples due to our shared past shouldn’t be underestimated. There is certainly a sense of strong connection binding us that could serve as a powerful asset.’ And he concludes by saying: ‘I have high hopes that today’s partnership will serve us in good stead and with it we can build on our unique complementarities and make them serve the welfare of our peoples. This is the kind of partnership that Ambassador Retno Marsudi promotes. 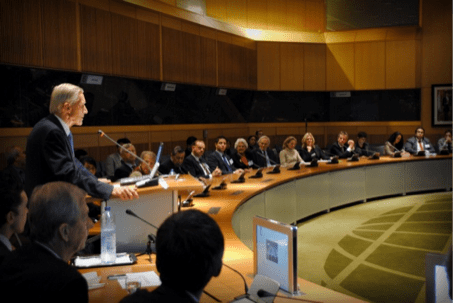 She called it, version 2.0, a special relationship with tangible benefits for both sides.’ See under ‘events-speeches’ for the complete speech of Mr. Witjaksono. 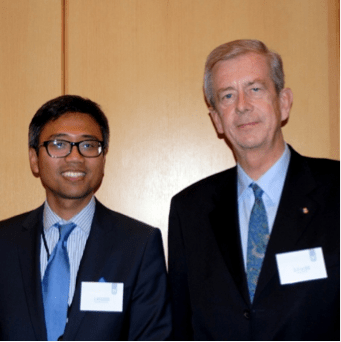 Note: during a luncheon in March 2014, the Members of the Board of INS Mr. Jesse Kuiper, Dr. Wim van Eekelen and Dr. Aljosja van Dorssen have conveyed the Linggadjati Award 2013 in person to Dr. Hassan Wirajuda. At the closing of the seminar Jesse Kuijper thanks the speakers for their precious contributions and the Direction Asia and Oceania for the generous support and facilitation of the INS Autumn 2013 seminar.